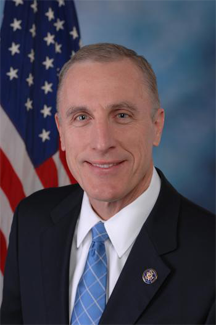 Tim Murphy, in an official photo for the 112th Congress (2011-2012), when he was representing District 18 of Pennsylvania as a Republican. His service ended abruptly in resignation following scandal in 2017. In the chaos, it was revealed that his management of his staff had been extremely abusive. The Pittsburg Post-Gazette reported about "…a June memo from Murphy's chief of staff, Susan Mosychuk, that said Murphy was creating a hostile work environment because of his 'inability to communicate without expressions of rage, criticisms or insults.' That behavior, she wrote, resulted in a 'near 100 percent turnover in one year's time.'" These conditions are especially troubling given that Murphy, again quoting the Post-Gazette, as "a psychologist who spent much of his congressional tenure working on mental-health [sic] issues, once wrote a book called: Overcoming Passive-Aggression: How to Stop Hidden Anger From Spoiling Your Relationships, Career, and Happiness . The way he's acted, it makes you wonder if he's actually read it." See the P-G's report by Charlie Deitch. Verbal abuse executed by a psychologist who is an expert in anger issues must be something very special to behold. To abuse someone verbally is to treat him or her with cruelty, especially regularly or repeatedly. Verbal abuse in the workplace is a special case, though, because most employers have policies banning such behavior, and many even prescribe punitive or disciplinary action. So at work, verbal abusers often undertake their abusive acts at times, in settings, and with tones that afford them safety from organizational discipline. Executed in this way, verbal abuse is actually a kind of covert bullying. Abusers generally choose from three common approaches. Abuse conducted in private is more readily denied than abuse conducted before witnesses. Private settings are more common than one might at first believe. Beyond the closed-door office, there are otherwise-empty hallways, elevators, rest rooms, stairwells, the grounds around the building, and telephone conversations. And the privacy needed by abusers isn't the airtight one-on-one kind. All that's required is that there be no witnesses who are fellow employees. By this standard, restaurants, airline flights, and public spaces of all kinds can suffice. Abusers who depend on privacy for safety sometimes forget that the same privacy also affords safety to the person abused — the target — if the target chooses to respond forcefully. This safety is useful for protecting targets who choose responses that witnesses might regard as unnecessarily harsh or insubordinate, even though the target might regard the response as appropriate and necessary. Some abusers are content with protection against disciplinary action. That is, they feel comfortable engaging in abuse so long as they're certain that there will be no disciplinary action. A typical scenario: the supervisor abusing a subordinate in an emergency meeting called to deal with a product recall or data breach. In such situations, there is an organizational tendency to place mission over manners and legalities. If the abuser's perception of protection from disciplinary action is accurate, organizational policy isn't relevant, and the target is in real danger. In such circumstances, appeals to Human Resources — rarely of much use to targets in any case — are almost certainly dangerous to the target. Voluntary termination or transfer is more likely to afford protection for the target. Transferring to the domain of someone more powerful than the abuser or the abuser's protector is an especially attractive option for targets. safety from organizational disciplineof the abuser are at all ambiguous, then if questioned, the abuser can deny that any abusive behavior took place. That is, the abuser can assert that no abuse was intended and that the target is being "overly sensitive," or that the abuser was "only joking and <the target> took it the wrong way." In espionage and politics, this ambiguity strategy is called "plausible deniability." Targets must examine carefully the tone and wording of the abuser's attack. If the attack can plausibly be interpreted as inoffensive by someone who's unfamiliar with the context of the relationship between the abuser and the target, the ambiguity strategy might be in effect. This is especially likely if fully grasping the intensity of the offense in the current attack requires special information about past attacks. Would you like to see your comments posted here? rbrenJrFAeoQCiGdSwQZQner@ChacAzELsQtCfhuGBgiVoCanyon.comSend me your comments by email, or by Web form. I offer email and telephone coaching at both corporate and individual rates. Contact Rick for details at rbrenLmdKmCfEzeHUciGAner@ChacNErbUcpmqJXLzRuDoCanyon.com or (650) 787-6475, or toll-free in the continental US at (866) 378-5470.